Even though the town center is just a short 15 minute walk away (depending on your fitness level and pace), it is important that you wear comfortable shoes because the old town area has steep hills that may cause blisters if not wearing proper shoes. When walking around the old town center, be prepared to walk uphill and downhill often. The Port Authority of Cagliari offers a free shuttle bus from your cruise ship to the roundabout at Piazza Matteotti, close to the train station and bus terminal and the center of town. A new 1300 square meter cruise terminal - made entirely of laminated wood - has just been built. Beach: Few cities are blessed with a vast and picturesque beach within a few minutes of the center and the locals take full advantage of Poetto Beach, 5 km west of the city, frequently abandoning their offices for an extended lunch-hour or an afternoon swim at the place they call il salotto (the living room). The beach, extending for nearly 7km, is rarely crowded, and yellow buses (marked PQ and PF) leave every five minutes from the city center. 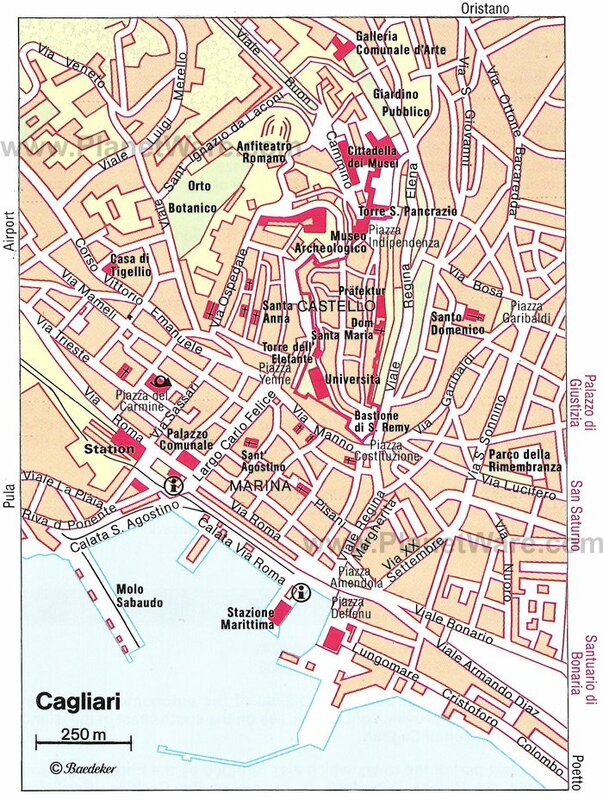 Most of the important sites of the city are within walking distance of the Castello including the Cathedral, the Botanic Garden, and the Necropolis. Close to the cruise dock starts a one hour bus tour, showing the highlights of Cagliari. Barumini is about 1,1/2 hour bus ride north of Cagliari and is famous for its Nuraghi Su Nurax. There are a number of popular natural attractions in and near Cagliari including Cap Sant'Elia (one of the city's hills) and the well-known hiking trails at the Devil's Saddle. Just west of the Cape is the salty lagoon known as Molentargius, famous for thousands of flamingos. Arcaded Via Roma has the smartest shops and department stores, which cater for the cruise ship day-trippers as much as the locals, but the two most interesting and rewarding shopping streets are the traffic-free Via Manno and Via Garibaldi. Most shops and businesses in Italy opens from Monday to Saturday from around 8am until 1pm, and from about 4pm until 7pm, though many shops close on Saturday afternoons and Monday mornings, and in the south, the day can begin and end an hour later. In the north, some businesses work to a 9am-5pm day to facilitate international dealings. Traditionally, everything except bars and restaurants closes on Sunday, though most towns have a pasticceria open in the mornings, while in large cities and tourist areas, Sunday opening is becoming more common.